Okay, so earlier this week we talked about color blindness and how that would affect people’s ability to tell the difference between an undead and a ghoul. We should have done a value test (black and white version of the designs) side by side to make sure our designs are easily differentiated from each other. Here’s a good example of how sticking to design principles has helped us create a better looking design. I first started out by trying to add big streams of glowing red smoke coming off of the ghoul, but that made the design look too busy and chaotic (as well as less scary because the skeleton wasn’t showing through as much). So I decided to localize parts of the effect to the furthest-most extremities; only the feet, tail and eyes have that heavy magical smoke effect. The glowing muscle effect on the rest of the body is similar to the undead in brightness, but the smoke effect is more turbulent and makes it look more feral. So, now lets do the value test. Does it check out? You can certainly tell the difference between the undead and ghouls no matter what kind of color blindness you have based on the value test. The undead are more reserved in their posture and magical effects, and the ghouls have these big flaming eyes and feet that really help to set them apart. Oh, and I also added glowing footprints, which I thought was a cool addition. So far so good. I’m really excited about the new ghoul design, and that I was able to post it before the week ends…Pacific Standard Time. Uh oh, looks like the ghoul went to go play fetch. What is it bringing back? And to finish off this blog post, how about yet another picture of a squirrel! It appears I have discovered the secret to persuading Glen to draw pictures of you. You realize how this is going to set in with future projects right? The Lumaglyph running gag maybe? 🙂 Adam, I’m sure we will all get our turn. Hang in there. 😀 Hilarious I’m afraid. Glen, these are awesome! I especially do like the glowing footprints and the more aggressive attitude to set the ghoul apart. I can see how the flaming smoke could have become overwhelming, but you handled that really well. Great creative thinking and well solved. 🙂 Yay! 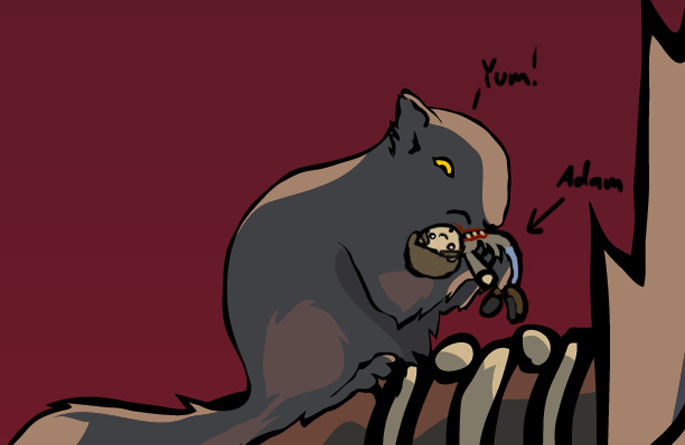 Yeah, I think having squirrels in all of our projects would make a great gag. In fact I’m trying to figure out how I’m going to work one into the new Lumaglyph logo! Ooh, ooh! Draw me too! So great going with those late drawings, Glen! Hey Adam, does this count as Tuesday’s blog post as well? Glen, I have never met you, but you are fast becoming my best friend.